The cast of Federico Garcia Lorca’s “Blood Wedding,” through Nov. 19 at the Wilma Theater. Blood Wedding comes at you full gallop. 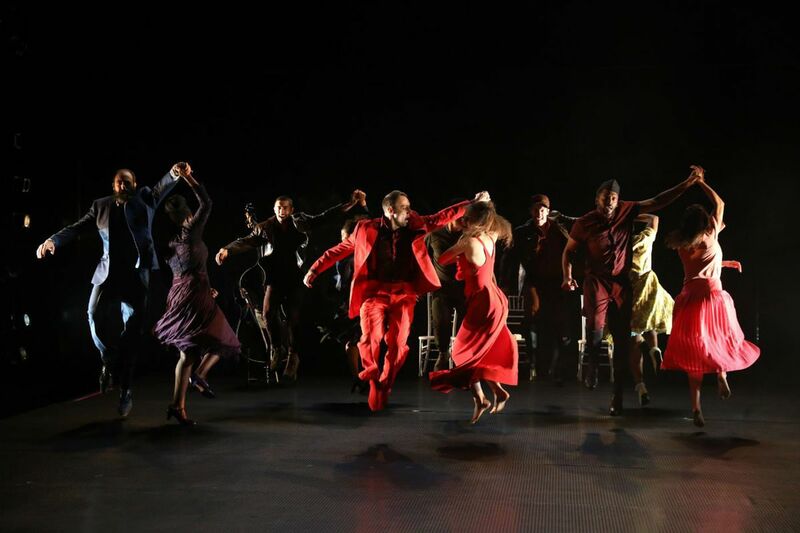 Singing a stark, imbricated melody, the ensemble delivers a stampeding opening dance, impetuous and disciplined, thrilling and brutalizing, wedding dance and funeral dance, exuberance and anguish. Dancers make shapes and units, break, realign; we glimpse flamenco, folk dance, classical, postmodern; stabbing motions; foot-grabbing as if inspecting hooves; abandonment and resistance; conflicted motive; forecasts of passion and doom. At the Wilma Theater through Nov. 19, Blood Wedding by Federico García Lorca has been in development in the Wilma's Hothouse incubator for more than a year. Csaba Horváth, the Hungarian artist who infuses drama with physical theater, dance, and performance art, honors and transforms Lorca's tragedy. Csaba Ökrös writes jagged songs that undermine yet reveal. It may be too strong or too experimental for some tastes, but for me Blood Wedding is the best thing I've seen this season. We are in an isolated village on the dry Andalusian plain. Our chorus is the Mother, in a towering performance by Jaylene Clark Owens. Having lost a husband and son to a blood feud, she has misgivings about her son's choice of bride. The Groom (played with headlong cluelessness by Jered McLenigan) is a good boy, sure of his duty and desires. His mother's fatalism is lost on him: "I looked at your father, and when they killed him I looked at the wall in front of me." That opening dance and Clark's dominance risk a letdown, but this cast has too much energy. Brett Ashley Robinson is funny as a gossipy neighbor. Campbell O'Hare as the Bride really wants to do what's expected of her. But she's hard, distracted: When she dons her bridal garland, she spasms, staggers, at odds. She has plenty of awkward dancing to come. The ensemble is full of multi-instrumentalists. Sarah Gliko is especially marvelous, her flute and alto sax both lyrical and choked. She shines again as the wife of Leonardo (played with muscular, hopeless restraint by Lindsay Smiling). "I've turned into an afterthought," she tells Leonardo, while he's busy pleading with the Bride: "Tell me, who have I been to you?" The singing is not as sharp as the dancing. With such challenging, key-shifting music, you have to sing more precisely rather than less, and intonation was often not there. But the dancing: As the company sings a gay bridal song, the Bride, far upstage on a high platform, writhes in self-destructive fury. Horváth and ensemble show crucial restraint in the centerpiece. Dialogue-driven at beginning and end, Blood Wedding rises to a pitch halfway, vivid, surreal, and the dancing dials down a little. The Moon (a neat turn by Ross Beschler, in a steely, silver suit) plays his folk-poetry role, certain that "No one can escape me." With "daggers and shotguns for 30 miles in all directions," even moonlight is a kind of knife. The Trojan Women-like ending can seem anticlimactic, but Clark and O'Hare ("a lost woman and a virgin") bring off a teeth-gritting dialogue – amid some very inventive stage work. "In the end, the passion in their blood was stronger" – stronger than family, tradition, sense. Drive wins; fate wins. So does this production, doing justice to Lorca, whose brilliance as a playwright should be better known in this country. I'll be a guest at Blood Wedding again soon.